Finally venturing off into a new size category, Apple now has a direct competitor to the renowned Google Nexus 7, which was recently updated slightly with more memory. Although it’s quite obvious that one is indeed smaller than the other, there’s no questioning that many consumers are going to keep the two into consideration when shopping around for compact sized tablets – as opposed to the traditional hunky ones we’re commonly exposed to. In the end, it goes without saying that there are a lot of people curious to know which of the two should they invest their money in, but more importantly, which one will deliver the most value. Rather than stating the obvious, we’ll merely point out some of our likes and dislikes between the two. For the iPad mini, it surely stands out most for its impeccable construction, higher-quality choice of materials, and its incredible svelte body (0.28” thin), which we have to admit, makes the Nexus 7 look hulky (0.41” thick) in comparison. 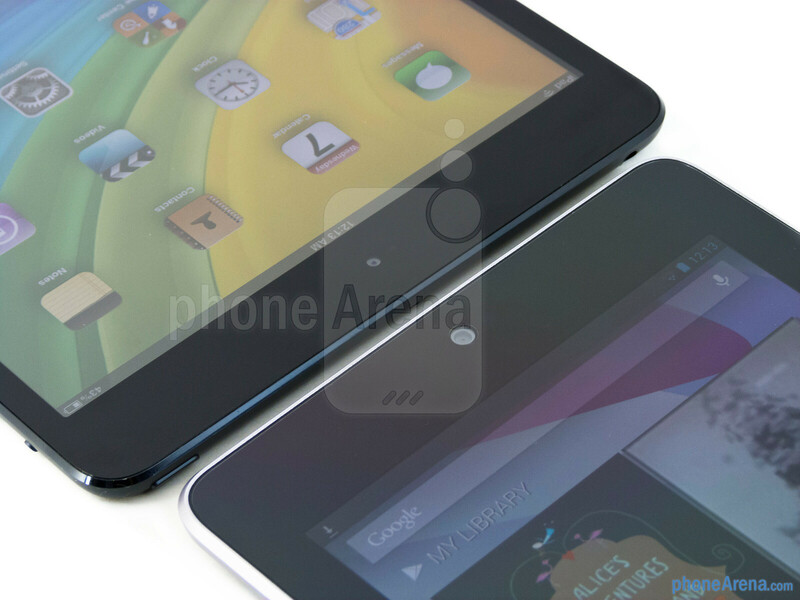 Conversely, we find the Google Nexus 7 easier to handle in the hand, which is attributed to its narrower body. Ultimately, it’s hard to overlook the iPad mini’s superb construction, which goes to show why it’s the higher priced tablet. Seeing that it’s delivering the pure Android experience, the typical set of Android buttons are incorporated into the Nexus 7’s interface – whereas with the iPad mini, it’s still rocking Apple’s distinct recessed home button. Sharing many commonalities around their trims, these include their microphones, 3.5mm headset jacks, power buttons, volume controls, and power/data ports. With the latter, however, the Google Nexus 7 relies on the favorable microUSB port – with the iPad mini opting to employ Apple’s new Lighting docking port. 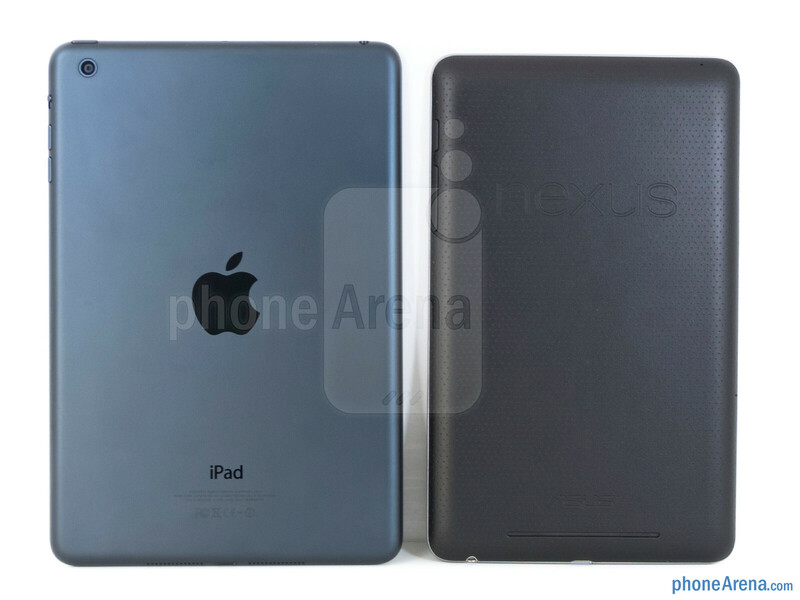 As for their speakers, the iPad mini features left and right ones on its bottom trim, while the Nexus 7 has a single small strip in its rear. Are you the kind of person who doesn’t have any shame snapping photos with a tablet? If so, then you’ll probably want to stick with the iPad mini, since it packs a front-facing 1.2-megapixel camera that’s capable of shooting 720p videos, and a 5-megapixel autofocus rear camera for all your usual shots. 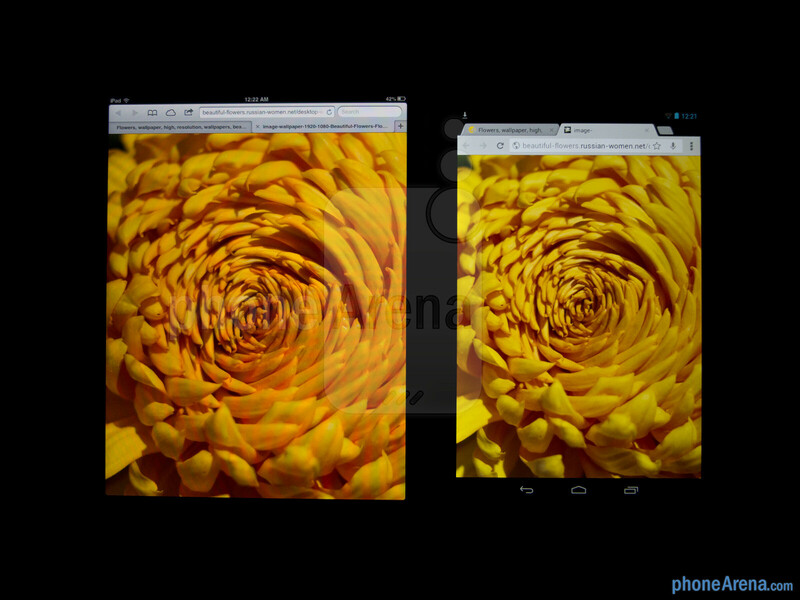 Oppositely, the Nexus 7 only packs a single one – a front-facing snapper and nothing more! Strangely, some people will be irked in their attempt to fathom how one tablet is priced more, but has the lower resolution display between the two. Even though the iPad mini is flaunting a larger 7.9-inch IPS LCD display, it’s simply lacking any sharp details with its surprisingly low resolution of 1024 x 768 (162 ppi). In contrast, the Google Nexus 7 impresses us more with its attention for detail thanks to its 7-inch WXGA 1280 x 800 IPS display (216 ppi). From a normal distance, one would have a tough time trying to distinguish which of the two is exhibiting the sharper visuals, but upon closer inspection, the question is soundly put to sleep, as the Nexus 7 delivers the goods. However, they do share some other very favorable aspects – like their iridescent color tones, wide viewing angles, high brightness output, and good outdoor visibility. OS alone is enough for me to decide. 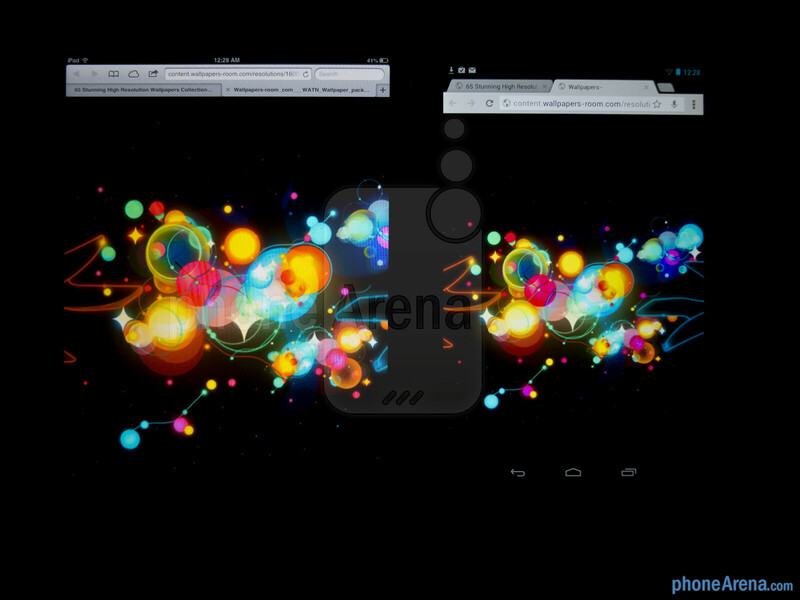 Nexus 7 is the clear winner. We also enjoy another thing you sheepple don't have: brains! It's clear the N7 slaughters the mini but yet again, PA reviewers refuse to admit it. It's like every single time the clear winner is another brand, they resort to saying the idevice holds its own because it looks pretty. Come up with a new line, that one's getting old. 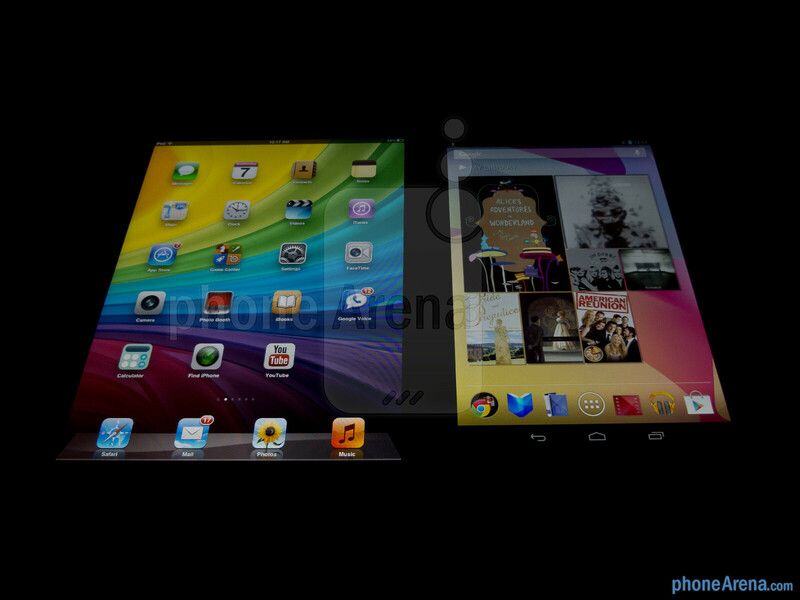 That's the only argument you can make for the iPad mini over the Nexus 7, looks. Looks and design is subjective. Why do you say the Nexus 7 is cheap, just because it's not made of the same material as a can of coke? If you watch reviews on youtube, the consensus is that the Nexus 7 actually feels better in the hand than the iPad mini. Just because something isn't aluminum and doesn't have an Apple on it doesn't make it cheap. 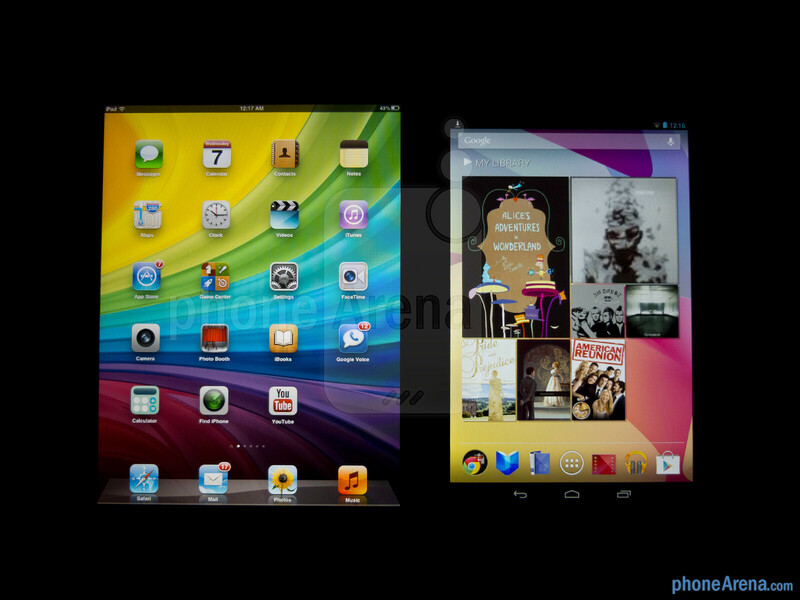 Nexus 7 may have a high res display but the ipad mini has at least 70% more color saturation. Nexus 7s app selection can't even compare with the one offered by the mini. 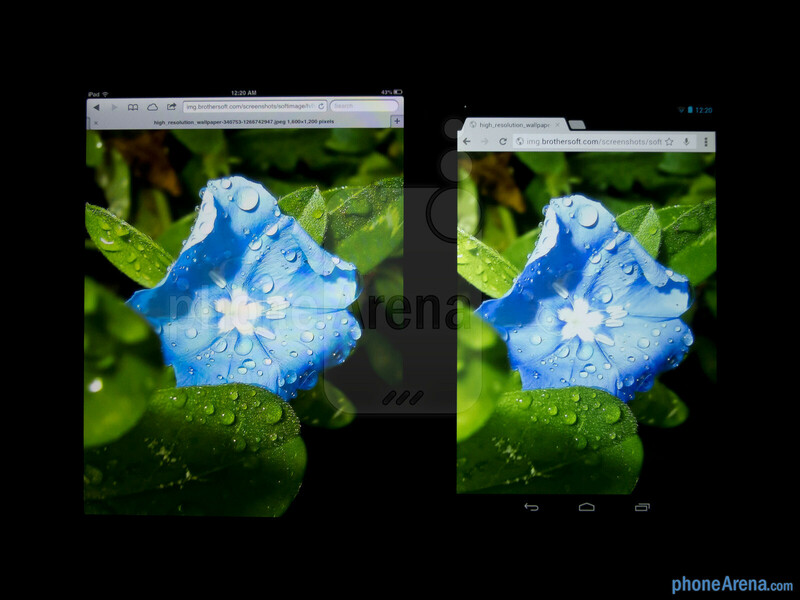 Nexus 7 browser is LAGGY specially in the google image viewer for tablets. Ipad mini simply offers the better browsing experience. 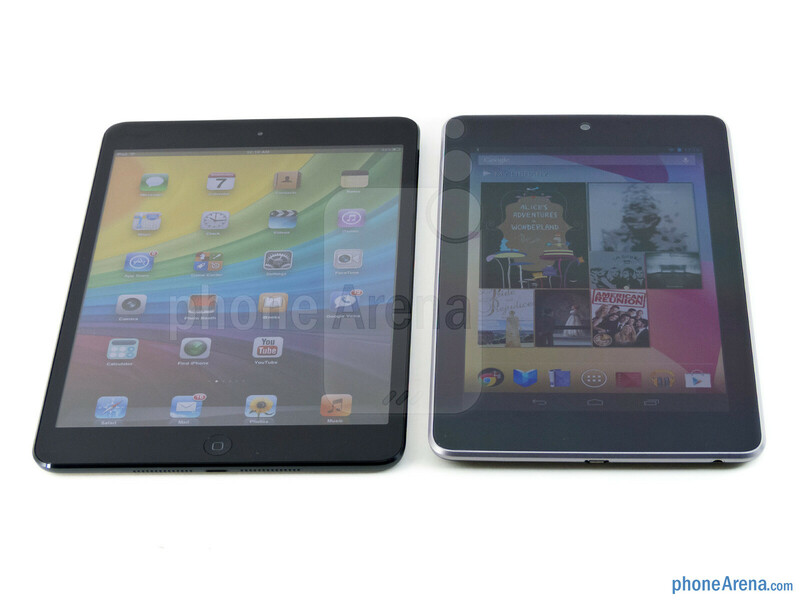 Ipad minis screen is much larger than the nexus 7, ipad mini is much thinner and much lighter than ur cheap nexus 7. Android apps have a sick UI which looks very cheap(few of them have good UIS but as I said- few? Ipad mini also has the better front facing camera and an iSight camera at the back for great pictures and 1080p video recording. Ipad 3 has the same iSight camera as my iPad 3 and I can assure you that that camera takes awesome pics and great videos. Ipad mini is better built and even though it has an A5 dual core, it runs smoother than nexus 7. Android 4.1 is smooth but not as smooth as ios. In benchmarks it has been proven that the A5 offers better GPU performance so it has better gaming. You see I have many arguments. 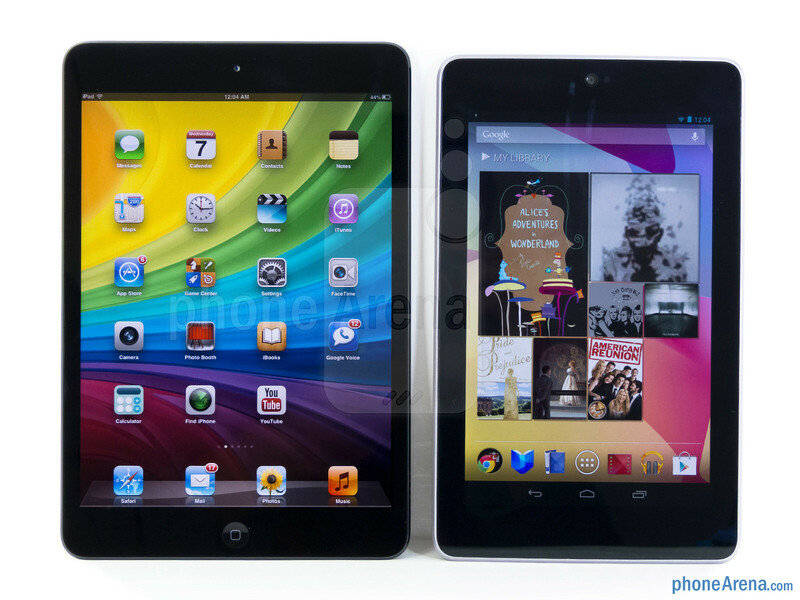 Nexus 7 is great but not perfect and the same can be said for the iPad Mini. App selection is such a joke. The Nexus 7 can use any android apps. The iPad has to have a separate app developed for them since it can't run iPhone apps. Nexus 7 has over 700K apps vs. 250K for IOS. While it's true that some apps are not optimized for "tablet", that's not the fault of the device, that's the developer not updating their app, which they will as tablets for android gets more popular. Reviews keeps saying IOS has such great app selection but what app is on IOS that is not on android? Thinner doesn't mean better, the Nexus 7 is better to hold in the hand, so for me that's a plus for Nexus 7 over the iPad mini. The camera is useless on tablets, who takes pictures with a tablet? That's what a phone is for. Benchmarks doesn't mean much. iPad will always run better since the IOS is just a grid of icons where Android is more like a computer. I don't care what you buy, that's up to you. My only problem with you is that you keep insisting that the Nexus 7 is cheap and you haven't said anything valid in that regard. People are biased with the apple design. All their product is the same basic design. It just seems like reviewers prefer aluminum over other materials. But that is subjective, you can't say something is better just because it's made of aluminum. An ipad can run any iPhone app in expanded form and your tablet is cheap and ugly. You're bitter cause you wasted money on an inferior device. It's okay, at least you're cool since you have an Apple logo. hmm...i don't know if anybody told you, but it's all subjective buddy from aesthetics to hardware. Kronic keeps bashing the Nexus 7 saying it's ugly and cheap and I'm saying that it's all subjective. Has staring at a grid of icons all day and using apps that's the same thing as a website hindered your ability to read? And if you are curious what apps android has that ios doesn't, research these: Groove IP - allows you to make free calls using google voice. OverSkreen - web browser that you can resize and multitask with just like on a regular computer Lilipad - instant messenger that you can resize and multitask with just like a regular computer IOS is such an outdated OS. It's basically just an app drawer, a grid of icons. Android allows you to multitask just like a regular computer. I can watch a movie, browse the internet, and chat with someone on Gtalk all at the same time. Does IOS have an app for that? I don't think so. So when people say IOS has more apps selection it's for things like flashlight apps that no one even uses. that's fine. those apps aren't even necessary...but try ordering food from Chipotle (which is much more useful in my opinion) using the same app that's available for iOS & let me know when you find it. i would never use or care to use those apps you just mentioned. those apps are just revisions of functions that already available to any smart phone. that's the problem w/android fans...they focus on the most irrelevant functions & try to pass it off as superior software. i don't get it. How is true multitasking an irrelevant function? There are plenty of apps on android that allows you to order food from Chipotle. Just go to the Play store and search the term Chipotle. But you definitely don't get it. You think an app like Chipotle is more useful than apps that allow you to multitask even though it's the same function as just going to the website? I think you've been indoctrinated by Steve Job and you don't have any sense of reason and logic. Where did you get that percentage for screen saturation? I'm no expert, but I'm pretty sure that's exaggerated by a LOT. The browser is laggy? On page 2 of the comparison it says that *both* tablets have "peppy page loads, fluid navigational controls, and proper rendering" Now, I haven't used a lot of apps from Google Play, but the ones I have used usually take advantage of the Holo UI in ICS and look very good honestly. How does the Mini have a better front camera? Aren't they both 1.2 MP 720p capable? MP aren't everything, but on that small of a scale that's most of what matters. The vast majority of people do NOT care about back cameras on tablets. They hold very little purpose and make you look like an idiot when you take pictures with them. Front cameras are much more convenient on tablets. Yes, the iPad mini is smooth, but the Nexus 7 is just as smooth as iOS on the mini just because A5 < Tegra 3; but then you have to add the responsiveness Project Butter brings and Nexus 7 > iPad mini in terms of fluidity. You have to take into consideration that iOS has slow transition effects and animations that make it seem smoother than it really is, meanwhile Jelly Bean is fast all around and responds almost instantly. As for gaming and GPU power; yes, the A5 does tend to beat out the Tegra 3 in terms of GPU. However, both are still very respectable and bring stable frame rates and similar real-life performance. 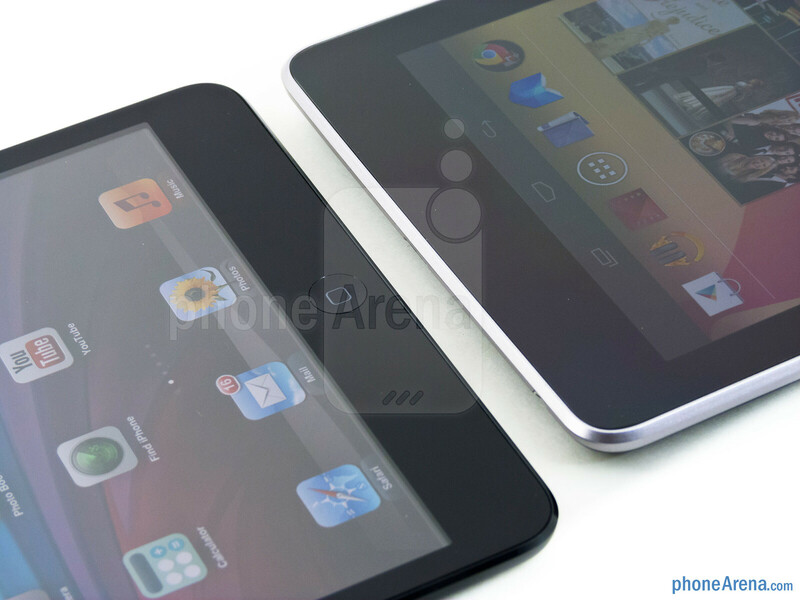 Also, I like the look of the Nexus 7 more than the iPad mini. Yes, it is made out of better materials, but the overall shape takes that advantage away. The Nexus 7 has a much better form factor for tablets of this range. 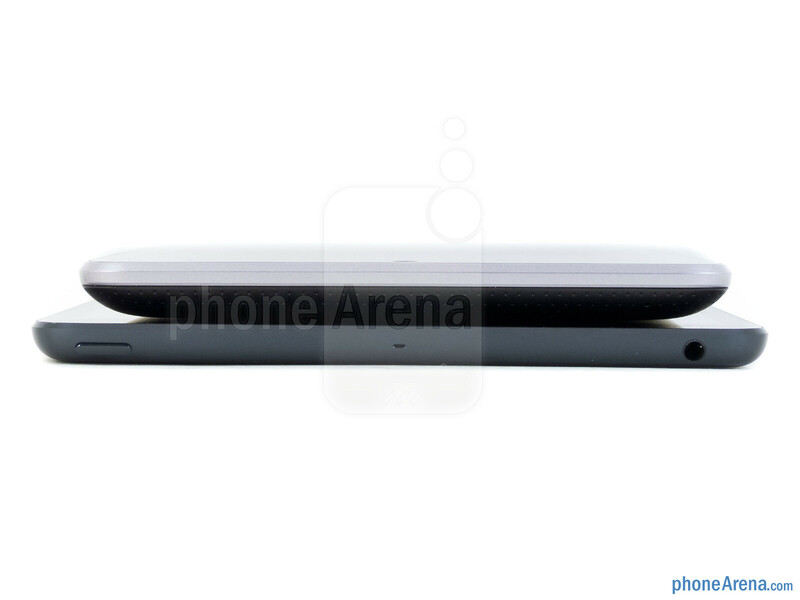 The tiny bezel on the iPad mini looks a bit odd to me as well. Yes, both are great tablets, but your arguments are pretty much null. These tablets bring a similar experience when compared, so it really comes down to form factor and OS preference, so (for me) that goes to the Nexus 7 just because of the narrower shape and Android experience. I just logged in to thumb down your ignorant comment. Kindle fire HD is MY choice, and any other smart person with a grade of 98.0 IN MATH!!! I had a different opinion until Android Jelly Bean. It shows that unjailbroken iOS' restrictions left it to stagnate and update only in hardware, while Google's open-minded, geeky "all-open" philisophy turned out to be the winner in the long term. Actually, the iPad mini offers the slightly better hardware; while also the inferior software, only with iTunes and App Store to be mentioned as the better content sources by now. It should be mentioned that i missed the form factor comparison, 3:4 8 inches just is not the same as 16:9 7 inch, each has its benefits. Well, i would go for the Nexus 7, as you can't do much wrong with 199 dollars for an Google-branded High-end device. At the same price point i would... Nah, can't decide. Another win for the iPad! 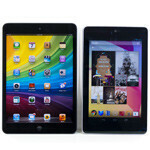 iPad Mini in features and hardware but Maxi in the price how can win against the best value tablet out there? Another win for the Nexus 7! Also for me since I'm $130 richer than people who bought the iPad mini. Criticize the Nexus 7 all you want. I'm enjoying my extra money. No contest really. Both are nice pieces but only one costs as much a 7" tablet is worth. Do your family a favor, buy a Nexus 7 and spend the rest on a day with them. Better specs better is cheaper... nexus 7 please . in my honest opinion... ipad mini does looks good...but not worth its price! 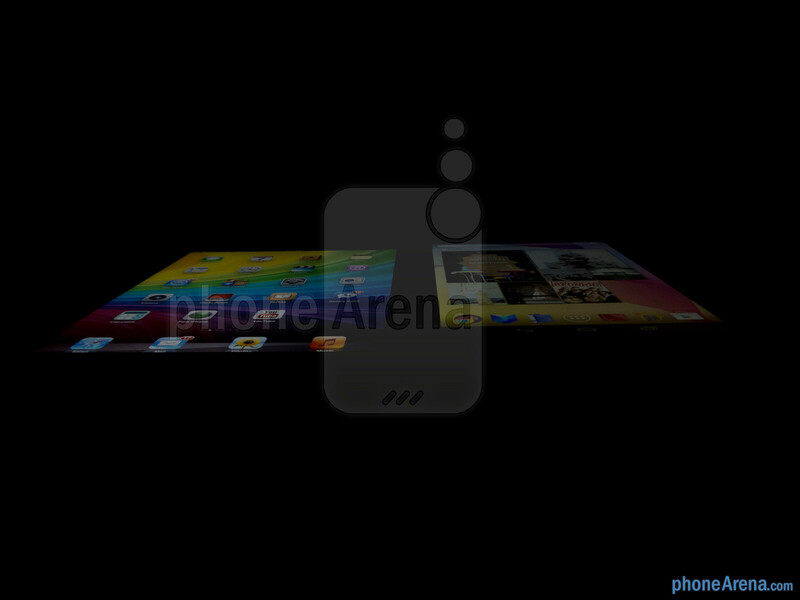 even though its not HD or retina, in comparison to the pics above, it shows how beautiful its screen is!!! but still not worth the $330! in my opinion the best 7" tablet will be either the nexus 7 or the BlackBerry Playbook (specially that it is now at $149 for the 16Gb!) or even the amazon kindle fire HD i really made a conclusion to all the apple products that apple make! if they announce something "new" the first generation is not worthy--- in case if you're just a techie guy, not a die hard apple fan. i mean look at the original iPad and iPhone?! both are pricier than its competition! but they are underpowered! no camera and a lot of good stuff that a smartphone(in iPhone's case) already offers that time, but the capacitive multitouch is a good add on though! so buying iPad mini at price $330 is a suicide! if you're just a tech fan but you want a 7" tablet, better buy nexus 7 the best android tablet to offer but no rear facing camera if you want to have one (in my case i want rear facing camera) or galacy or any other 7" android tablet that will give you portability and if you want semi iOS ecosystem...im pretty sure most of the iOS titles are available in the google play! ,Playbook(updgradable to BB10 and the ability to run android apps are its selling point and i mean only for $149?! its a bargain! ), orkindle fire HD, as an e-reader! but if you want the 7.9" of iPad min, better wait for next year coz im pretty sure they'll announce a retina/HD version of the iPad mini!